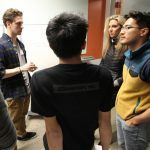 INNOVATE-O-thon is a real-world, experiential learning program that connects Ohio State students with companies wanting better access to the university and undergraduates through externship opportunities. This externship is a unique type of on-campus internship that partners students, the university, and potential employers in a way that challenges students to apply their academic studies in the pursuit of real-world solutions. Several times a semester, the Institute for Materials Research invites a selected company’s representatives to challenge undergraduates to dissect a real problem and devise and propose a suitable, executable solution to that company. Through the course of an intense weekend, students form interdisciplinary teams to create innovative solutions to support the needs of that company. From brainstorming to project budgeting, students are given the reins to produce the best concept. The INNOVATE-O-thon externship program is a unique opportunity to participate in real business workshops, work with a global business leaders, and put a nice touch on your resume. All undergraduate majors and grade levels welcome. The best innovations can be found in any discipline, from English or engineering to business or biochemistry. Companies that previously participated in INNOVATE-O-thons include Honda R&D; Black & Decker; Greif, Inc., a global leader in industrial packaging products and services; and ENGIE, which makes up half of the joint venture with Axium Infrastructure called Ohio State Energy Partners. Contact Kari Roth (roth.570@osu.edu) with any questions. Click here to hear more from students participants. Click here to check out the ENGIE INNOVATE_O-thon brainstorming event. 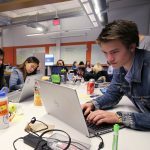 An INNOVATE-O-thon gives undergraduate students from all majors a chance to get real-world experience and connections through the development of a unique product with a specific purpose. Each INNOVATE-O-thon has a particular “theme” that is chosen by the industry partners of the event and gives students the idea of the function of the product they create. At the end of the event, students are able to pitch the idea to the industry partners and receive feedback. An externship is a unique type of internship defined as on-campus partnership between students, the university, and potential employers that formally integrates students’ academic study with work, which is typically of less than a week in duration. All majors and grade levels are encouraged to participate in the INNOVATE-O-thon.